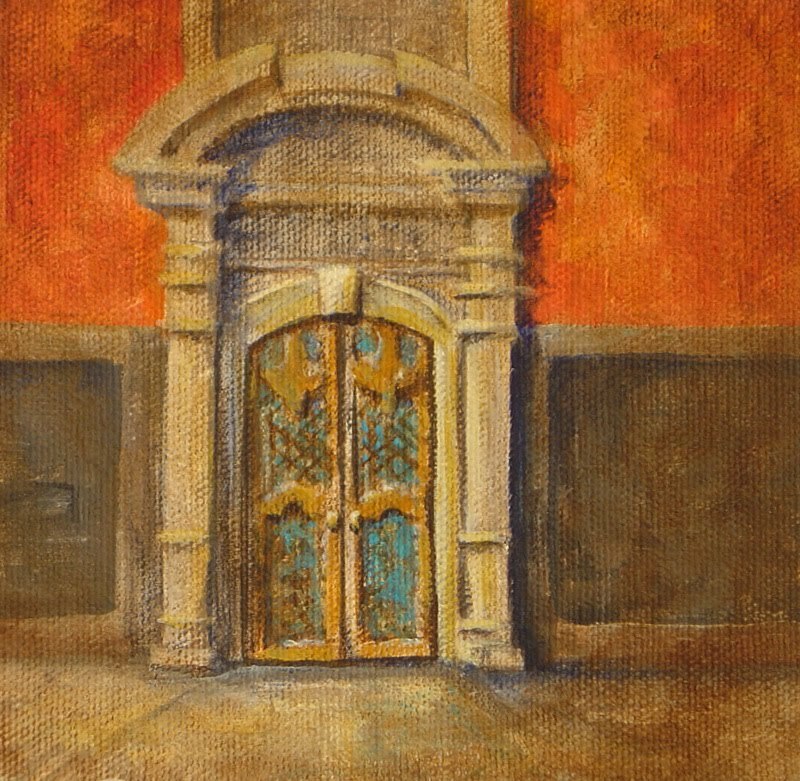 Steven W. Dunn: "San Miguel Doorway"
San Miguel de Allende(Mexico) has many architecturally and colorfully interesting doorways. On the other side of these entrances one might find a lovely shaded, landscaped garden with verdent lush plantings and a water feature, usually a fountain in the center of the garden, inviting you to relax, visit and have a drink to toast the beauty of life. I gave this to one of my beautiful sisters who loves San Miguel (as I do) so very much. Acrylic on Canvas 5" X 5"
Labels: Cityscapes and Streetscenes, House "Portraits"
As always, it's lovely. Happy New Year! We will have to do lunch or a glass of wine to catch up. Miss you. I love this small gem of a painting. The beauty of the architecture combined with the mystery of what lies beyond is irresistable. I snapped many photos of interesting old doors during our last visit to the small Italian town of Pitigliano. I find them difficult to paint, too, because without meaning to, they become portraits with too much detail. Again, best wishes for 2011 and very nice work. "Bright Day in Reynolda Gardens"